Bingola joined the Mandalay Media portfolio on 1st September 2014. The bingo games offered by the site are powered by the 888 software so the chances are, when you register to play you will feel right at home. When you land at the site for the first time you’re greeted with a funfair theme complete with rollercoasters and a ferris wheel, we know we have seen a similar theme before at another, not to dissimilarly named, established brand. The homepage tells of the welcome bonus on offer for new players, some of the big jackpots that are on offer, details of some of the winners and a look at what today has to offer Bingola players. Getting in on the action will take you just minutes with a standard registration form to complete to sign up for an account. It is worthing noting thought that if the site boasts is offering a no deposit required bonus when you sign up, credit/debit card details are required as part of the sign up process. This is for account validation only and money will not be taken unless you choose to make a deposit. When you have chosen your username you are ready to step in and enjoy all the fun of the Bingola fair. Like all sites from this company using the same software there are just three variants of the online bingo game offered. You can play 75 ball pattern games and 90 ball bingo as well as some 75 ball multi line games. It is from the main lobby that you can see exactly what is on offer by way of bingo games, instant wins and jackpots. The navigation is a tabular, horizontal menu and under each you can find an abundance of information about what each room or section has to offer. When you have chosen the bingo room you wish to visit you simply click it to enter. Upon entering a room at Bingola you will find the usual layout from the 888 software. There are your purchasing options to the left of the screen (this becomes the call board when the game is in play), the centre of the screen is your bingo tickets with the prize details above and then chat is on the right with instant win mini game options above. Sadly Bingola and other sites from this group have just one main chat room unlike other brands on 888 software where you can enter the room corresponding to the game you are playing. 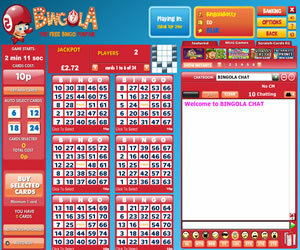 There are plenty of free bingo options available to players at Bingola. New players are given access to a free room for £15 jackpots every hour following their first deposit. On reloads you get 24 hours access to another free room offering £20 jackpots every hour. You should note that like some of the big jackpot games on offer at Bingola, these are networked rooms so you are competing against other players at other sites. Jackpots are available in abundance at Bingola too but again, many of these (if not all) are networked games. We couldn’t find any details or evidence of progressive jackpots being offered for bingo but the instant win games do have a selection of bingo money progressives available – like Millionaire Genie! Bingola looks pretty impressive but when you take into account the networked rooms, it is just a skin from Mandalay Media – nothing new or exciting to be seen in the rooms at this site but it would be a thrilling ride if you were to win a share of the free £10K jackpot! 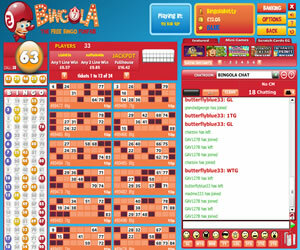 Bingola offers three different bingo game variants at their site. You are offered 75 ball pattern and 90 ball games as standard but will also find a selection of 75 ball multi-line games. 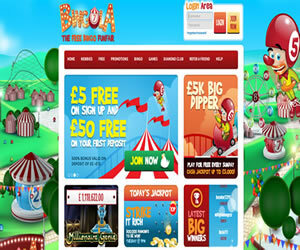 In addition to bingo the site offers an impressive array of instant win games. 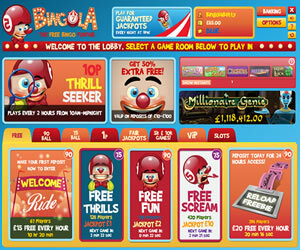 There are slots, scratchcards, casino style games and much more. The wagering requirements are 4x the deposit + bonus received. However, you can withdraw before meeting these requirements so long as you have deposited at least £20 in your account and have made a least one bet. Should you withdraw before meeting the wagering requirements then any bonus funds in your account will be lost.